What video and audio devices can I connect to the Digital Decorating Kit? We wanted the Digital Decorating Kit and the Digital Decorating Kit Plus to connect to lots of different devices to expand your decorating abilities. Laptops, Desktops, DVD Players, Tablets, you name it, there's probably a way to hook it up to your projector. To figure out if your device is compatible, check out these three video input options, which are available on both models. Both versions of the Digital Decorating Kit feature an HDMI input and will work with any media device that uses HDMI. 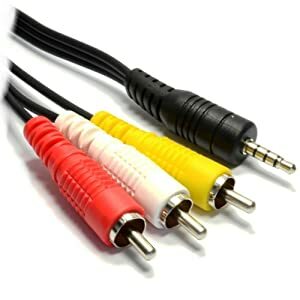 With the right adapter cables, HDMI can connect to many other devices including phones and tablets. If you are interested in connecting your device, try searching for your device model along with the words "HDMI adapter"
Composite cable delivers 480i SD video as well as audio. Both the Digital Decorating Kit and Digital Decorating Kit Plus feature a built-in speaker as well a 1/8" (3.5mm) audio headphone jack. The Digital Decorating Kit Plus has built in Bluetooth wireless audio; if you need to use Bluetooth with your Digital Decorating Kit, you can connect a Bluetooth transmitter to your projector using the headphone jack. For more info about using the audio output, check out this Help Center article about setting up outdoor audio!